When embarking on our pulling together the manufacturing outlook article for our December 2017 issue, we faced what many might describe as a good problem to have — too much content and not enough pages. What to do? This year we had 10 biopharmaceutical key opinion leaders willing to take part in this annual project, and we hope to have 10, perhaps more in the years to come. Space constraints of print, which we still view as being highly valuable, necessitated a solution, and why we created Life Science Leader’s exclusive Beyond The Printed Page online section of the magazine. We hope you enjoy this installment involving three biopharmaceutical key opinion leaders envisioning how biopharma manufacturing might look a decade from now. If you like what you read, consider becoming a subscriber today at our current special rate of $49 (enter coupon code ED49). 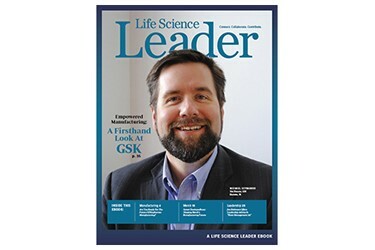 For while Beyond The Printed Page remains free, accessing all the great content Life Science Leader magazine has to offer still requires a subscription. Oh, in case you missed it, here is a link to a biopharmaceutical manufacturing article on emerging innovations. What Is Your Vision For How The Global Biopharmaceutical Manufacturing Industry Could Look In 2028 And Beyond? Roger Connor, president global manufacturing & supply, GSK: In future, I see synthetic biochemistry, especially the use of enzyme catalysts, playing a significant role in the manufacture of small molecules used as active pharmaceutical ingredients (APIs). The ability to compress several stages of chemical synthesis into one catalyzed transformation is going to shorten the manufacturing process and reduce environmental impact. Development of a new supply chain for these enzyme catalysts is going to be key to realizing the potential of this exciting technology. That said, cell and gene therapy will revolutionize manufacturing in pharmaceuticals by 2028. Although there are few applications today, we expect cell and gene therapy to grow rapidly as the technology develops. And it will fundamentally change the relationship between patients, healthcare providers and the manufacturer, with much closer, co-located partnerships required to deliver incredible treatments. By 2028, we believe there will be many more personalized medicines driving the industry to smaller more tailored production. These medicines will require us to be far more responsive and, in manufacturing, we will depend on much more comprehensive data flow and on-line analytics to facilitate real-time release and deliver what patients need. Personalized medicines will also drive novel dose forms using new technologies like 3D printing to meet individual requirements. At the same time, we expect to see a dramatic improvement in access to basic medicines, thanks to the efforts of pharmaceutical companies, charities and governments on behalf of many millions of people who do not have basic access to healthcare now. We can expect to see a far greater distinction between two types of manufacturing: large scale generic with high volume, low margin operating models; and specialist, niche-medicine production, delivering to very specific patient needs. The design of Pharma manufacturing supply chains will be more differentiated in ten years’ time, with upstream active pharmaceutical ingredient (API) and some secondary manufacturing in global locations aligned with R&D teams. More highly skilled teams will be required in these locations. Meanwhile, downstream ‘finishing’ and logistics will move closer to the patient. In the next ten years, I would like to see a radical transformation of the manufacturing environment to one that is truly designed around the needs of the process operator and laboratory technician. We need to adopt digital solutions that exist today in other industries in order to minimize the interface between humans and the machine and paper. By linking our systems together and providing digital solutions, coupled with lean sigma principles and a culture of continuous improvement, we can create a production system that will meet the needs of patients, regulators and payers. Today we create a lot of data within the pharmaceutical industry, but only use a fraction of it to support decision-making. By investing in enterprise resource planning (ERP) and supply chain capability, we will change the way we run our supply chains to improve product flow to the patients, supply reliability and inventory and logistics costs. Reliability and efficiency - We must continue to ensure a reliable supply of medicines and to improve our efficiency year over year. This will remain the foundation but it is not sufficient. Agility - In the next decade, the agility of our supply chain will be very important to manage an ever more global customer base with very dynamic, sometimes unpredictable demand. Reducing cycle times and leveraging vast amounts of data will be necessary to quickly adapt to changes in the market. Differentiation - The advances in science and our understanding of biology has resulted in a wide variety of modalities now in development at Amgen. Over the next ten years some will make it through the development process, and by 2028 we will need to be prepared to manufacture much more than the monoclonal antibodies and small molecules. Michael Thien, Ph.D., SVP and head biologics and sterile operating unit, Merck: Current trends in the biopharmaceutical industry include continued market growth, new product groups, cost pressures and localized manufacturing. All these drivers will exert pressure on biomanufacturers to accelerate innovation in processing platforms, in collaboration with supply partners, academics, regulators and government agencies. Process technologies, automated mobile modular facility build, real time release, supplier partnership and knowledge management will all combine to enable the biomanufacturing scenarios of the future.